Place each breast half between 2 sheets of heavy-duty plastic wrap; pound to 1/2-inch thickness using a meat mallet or small heavy skillet. Place flour in a shallow dish, and dredge chicken in flour, pepper parsley mixture. Heat oil in a large skillet over medium-high heat. Add chicken, and cook for 3 minutes on each side or until browned. Remove chicken from pan; keep warm. Add white wine, lemon zest and juice, capers, and garlic to pan; scrape pan to loosen browned bits. Cook for 2 minutes or until slightly thick. Sprinkle with salt and pepper. 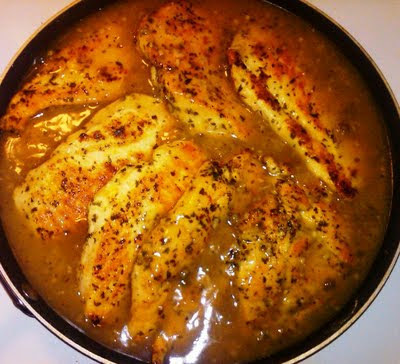 Return Chicken to pan, and allow to simmer no more than 10 minutes. Serve chicken over pasta. Top with sauce; sprinkle with parsley. This looks heavenly! I LOVE CHICKEN PICATTA! Im going to try this tomorrow night! Thank Bob! Tell Craig hi!